Newsflash: Panel 1 Speakers for ICCA 2018 Sydney Announced! Over the next few weeks, ICCA 2018 Sydney will be be announcing the panels for the Congress next year! Here we introduce the Moderator and Speakers for the first panel of the Congress, scheduled to take place on Monday 16 April. Panel 1: Law-Making in International Arbitration: What Legitimacy Challenges Lie Ahead? Session description: Law-making in international arbitration differs greatly from the domestic realm. Rather than through centralized legislation, it takes place in a decentralized network in which a variety of actors interact. This network encompasses arbitral tribunals who function as law-makers in private and public international law and in specialized fields, such as sports law. In addition, arbitration institutions, practitioner and professional associations (such as ICCA or the IBA), and international organizations (such as the UN International Law Commission and UNCITRAL) engage in the law-making process through the development of soft law instruments, model laws and rules, protocols, and best practices. These actors together shape both the substance and procedure of international arbitration. This, in turn, raises acute concerns about the authority and legitimacy of law-making processes, particularly as non-disputing parties are increasingly affected. 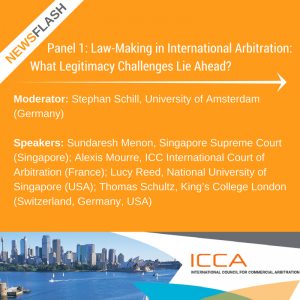 This panel will explore the extent and effect of lawmaking in international arbitration and will address criteria for its legitimacy. Click here to register for ICCA 2018 Sydney!